Simplicity doesn’t come easy. 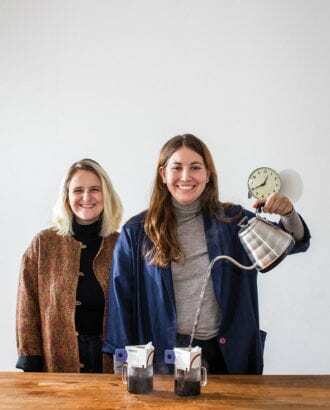 Just ask Kara Cohen and Ilana Kruger, creators of DripKit and two of our People to Watch in the 2019 Imbibe 75 Issue. “We looked at a lot of potential options for how we could create a product, and really the only requirement for us was that it was an easy way to make a great cup of coffee, that it was portable and mostly self-contained,” says Cohen. Kruger and Cohen wanted to be able to brew a larger cup of coffee, shorten the brew time, and prevent the grounds from resting in the brewed coffee. “We wanted it to feel more familiar, more intuitive, and to not over-extract the coffee,” says Kruger. The development process spanned more than six months and hundreds of prototypes. They consulted with Cohen’s brother, who studies packaging at Cal Poly, and hired some industrial product design students. At one point, they couldn’t figure out why everyone who opened the package spilled the coffee grounds, until Cohen and Kruger (both left-handed) watched a right-handed person open it from the other side. “It was definitely one of those moments where we thought we had thought of everything,” says Kruger. 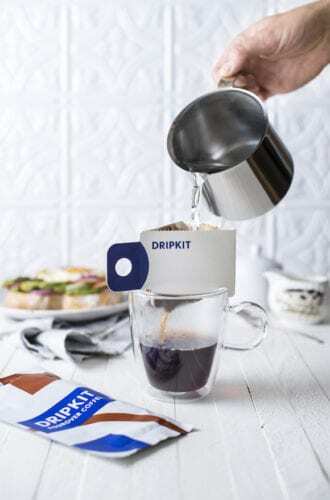 Ultimately, they partnered with New York City industrial design firm Prime Studio, which helped create products like Harry’s Razors and the Goby toothbrush, and they honed in on the design that became the DripKit—a cardboard tri-side that folds flat in the package but pops open to suspend a filter of pre-measured coffee grounds over any cup.